Fernand Graindorge, Liège (circa 1954). Galerie Beyeler, Basle, to whom sold to the present owner's family circa 1970. D. Rouart, J.-D. Rey and R. Mallard, Monet, Nymphéas, Paris, 1972 (illustrated). D. Wildenstein, Claude Monet, Biographie et catalogue raisonné, Vol. IV, 1899-1926, Lausanne, 1985, no. 1920 (illustrated p. 301). 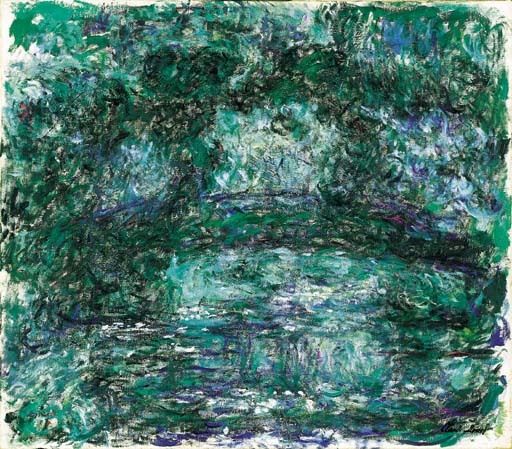 D. Wildenstein, Monet, catalogue raisonné, Munich, 1996, no. 1920 (illustrated p. 918). Zurich, Kunsthaus (on loan from 1981). Le Pont japonais belongs to the group of twenty-four Japanese Bridges that Monet painted at Giverny between 1916 and 1926 and which, along with the most abstract of the Nymphéas, were to be hailed as the culmination of Monet's career. At Giverny, Monet created a water-garden, Eastern in character, a theme accentuated by the construction of a Japanese foot-bridge and by planting bamboo, gingko trees, and Japanese fruit trees around the pond. Monet was partly inspired by Japanese prints but, above all, he wanted the oriental character of the bridge to add to the impression that the garden was exotic, timeless and otherwordly. Indeed, the principles of design in many ways echo those of the Japanese garden, and particularly the 'tea gardens' or 'strolling gardens' of the seventeenth and eighteenth centuries (P. H. Tucker, Monet in the 20th Century, London, 1998, p. 11). A visitor to the garden in 1901 was inspired to report: 'This is the famous water-lily garden, with its little green Japanese bridge spanning the ornamental lake surrounded by willows and other trees, either fancifully shaped or rare. When the sunlight plays upon the waters, it resembles - damascened as it is with the water lilies' great round leaves, and encrusted with the precious stones of their flowers - the masterwork of a goldsmith who has melded alloys of the most magical metals' (C. Stuckey, Monet, A Retrospective, New York, 1985, pp. 221-222). Monet had painted the Japanese bridge as early as 1895, however, in April 1918, he returned to this motif and inaugurated a new method of painting. Focussing exclusively on his jardin d'eau (fig. 1) and working directly from the motif, he started using two different formats for his oils: on the one side, he chose a very homogeneous group of canvases measuring 1 metre by 1, 1.3 or 1.5 metres, which became the basis for his easel-like, horizontal compositions, destined to be exhibited and thence sold; on the other, he employed a multifarious variety of canvases for a series of freer, more experimental works, depicting three different corners of the garden - the saules pleureurs (weeping-willows), the water garden, and the Japanese bridge (fig. 2). The Japanese bridge group depicts the foot-bridge crowned by its wisteria-festooned pergola. Bridge and pergola merge together with bank, reeds, water-lilies and reflections through a complex web of expressive gestural brushwork and cast in specific tonalities of predominently green-yellow, red-green or, as in the present work, blue-green effects. As Mary Stevens observed in Monet in the 20th Century, works from this period have been seen as 'portents and legitimizers of the New York school of abstract Expressionism. It is significant that two of the Japanese Bridge group (W. 1930 and W. 1931) were exhibited for the first time at the Knoedler Gallery, New York, in 1956, and entered American collections the following year, two years after the Museum of Modern Art had acquired its first great Water Lily decorative panel.' Henceforth, Monet's later (see fig. 3), and especially his most difficult work, became considered as the most significant. Please note that this work should be marked with a * in the catalogue indicating that VAT at 5 is payable on the hammer price and the buyer's premium. This VAT is refundable on export from the EU.